Oh, to get people to hold one of these absolutely gentle birds, their bones so fragile, and realize that we have the power to protect them! That we need to defend the most vulnerable - like babies. They don't need much from us to take care of them. They simply need us to stop eating them. And that's just it. They are babies. They are bred to grow very large, very fast. Not only can’t their voices keep up, but neither can their legs. And eventually, the lungs and hearts of these birds can't keep up either; many die before they are even sent to slaughter...Just under 24 million are slaughtered every day. With a number so large, how do I make every individual matter? How do I get people to understand a bird who most have absolutely no personal association with. How do we get people to see that chickens too are feeling, precious beings? To commemorate my 25th year of being a vegan, I have decided to share some stories from various investigations I have done of factory farms, auctions, and slaughterhouses. Though these investigations were conducted with the organization I started and ran, Viva!USA, they are a powerful part of my life and hopefully will help many understand why veganism is a key part to Food Empowerment Project's goal of a more just food system. I debated on the title for this blog and, well, you can let me know what you think. It does make me flash back to my early vegan days when I was in high school - a time when, I acknowledge, I could have done a better job of encouraging people to listen to what I had to say. But at the same time, the above title is the truth. People in the US who consume chickens are, well, eating babies. Most animals raised and killed for food are killed when they are young. Chickens slaughtered for food are chicks, really. They are less than two months old when they are killed. These absolutely gentle and fragile birds are mere babies. It has always been easy to find farms where chickens are being raised for "meat." There are so many of them. It is heartbreaking. The first farm I investigated was in Georgia. It was a Tyson facility. When I opened the door to the shed, I was hit with a wave of humidity and the intense smell of ammonia. It burned my nose and my chest. My lungs burned for a couple of days. You see, chickens are killed after seven weeks. 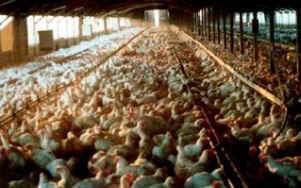 And workers do not go in and clean the sheds every time they send these chicks to slaughter; they just put more in. So the ammonia buildup is tremendous. I eventually sought to do investigations of Foster Farms, which are mostly in California. If the name doesn't sound familiar, the ads probably are: they tend to feature two puppet chickens who talk about wanting to be "Foster Farm" chickens. Yup, just as bad as the "Happy Cow" commercials. Inside the sheds (like all chicken farms), something seems very strange. After a while you realize it is the chickens themselves: their bodies seem abnormally large compared to their heads and their tiny little chirps. And that's just it. They are babies. They are bred to grow very large, very fast. Not only can't their voices keep up, but neither can their legs. And eventually, the lungs and hearts of these birds can’t keep up either; many die before they are even sent to slaughter. Leaving one of the sheds, it was my legs that gave way. Watching these babies struggling to stand wasn't even the main thing that made me fall down. And I do mean fall down...when leaving one of the sheds, I collapsed. I was overwhelmed. Overwhelmed with the number of birds. The reality of how many are killed. I could take 100 and would anyone even notice? With every investigation I did, my goal was to create a campaign -- something to focus on. And with chickens, I was overwhelmed with the magnitude of the lives being taken. Every farm had dozens of sheds, and each shed had approximately 20,000 chickens inside. At the time, 23 million chickens were slaughtered every day for food. Today it is just under 24 million. With a number so large, how do I make every individual matter? How do I get people to understand a bird who most have absolutely no personal association with. Not like cows who many pass along the highway. Not like ducks who they see on the ponds. Not like pigs who are the focus of movies. How do we get people to see that chickens too are feeling, precious beings? I hope the more we can get people to learn about chickens as individuals, the more they will empathize with them. Like how both hens and roosters will protect chicks, whether or not they are their offspring; how roosters will let off different warning calls to protect flocks; how chickens mourn, get happy, angry and, yes, have emotions. As with all animals, just getting to know them is key. But why must we get to know their personalities before we have empathy for them? Oh, to get people to hold one of these absolutely gentle birds, their bones so fragile, and realize that we have the power to protect them! That we need to defend the most vulnerable – like babies. They don’t need much from us to take care of them. They simply need us to stop eating them.